Is there a way to use Media companion to batch scrape all RT ratings and add them to existing nfo files? I only need MC to add the ratings to the nfo and keep the existing info. I guess I need to disable everything in MC except the ratings will this work? If the default naming isn’t "discart.png" or for movie and audio disks how do I change it to this? as @Edworld mentioned, this is under the 'Debug' tab. (2019-02-08, 04:12)melons2 Wrote: And I have noticed that at the end of an Search it will come back and say that it couldn’t scrape a particular movie but it still puts in the NFO file in the directory which then makes it hard for my other media scraping program to see that it needs to be done, how can I change this? Mixing media managers, hmmmm, this can cause some issues in itself. But, if you need to find the latest scraped movies, use the sort box and select 'By Date Added. This will bring the latest scraped to the top of the list. Quesitons, what is missing from Media Companion that means you need another media manager program? Just curious if there is a feature that might be beneficial to all, that I could add to Media Companion. I would like to be able to change naming: for instance if Media Companion's default for disc art is "movie name-disc.png" I would like to be able to change it to whatever I like such as "discart.png". 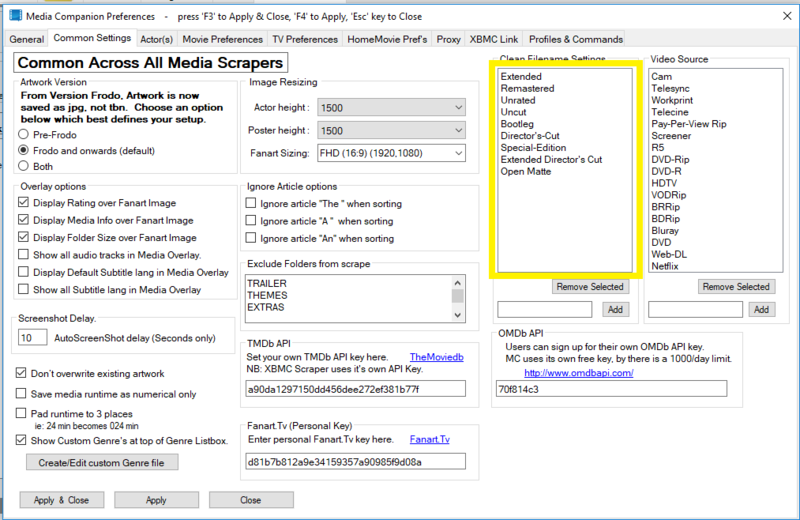 Media Companion puts an nfo in all movie folders, one's it can't scrape and tells you in the log and with other programs if they can't identify a movie for instance because the years wrong it will tell you, allow you edit it and re-scrape. In the end though the other programs do not leave an nfo in the movie folder if it can't be identified. The incorrectly left nfo fools KODI into thinking a different movie is there. I need some help please. How do I scrape a movie twice? to overwrite the 1st movie & I still have only 1 movie in my list. (2019-02-09, 14:46)melons2 Wrote: I would like to be able to change naming: for instance if Media Companion's default for disc art is "movie name-disc.png" I would like to be able to change it to whatever I like such as "discart.png". On Movie Preferences, Artwork Tab, there is the option to "Save Fanart.TV artwork as <moviename>-artwork". Uncheck this option to have the Fanart.TV artwork like "discart.png", "logo.png" etc, saved without the movie title prefix. (2019-02-09, 14:46)melons2 Wrote: Media Companion puts an nfo in all movie folders, one's it can't scrape and tells you in the log and with other programs if they can't identify a movie for instance because the years wrong it will tell you, allow you edit it and re-scrape. In the end though the other programs do not leave an nfo in the movie folder if it can't be identified. The incorrectly left nfo fools KODI into thinking a different movie is there. MC doesn't give the user the option Mid-Scrape to select a different movie Title. MC is trying to get higher accuracy and automation. Which is why the nfo is saved when no movie is found. MC can't determine if the incorrect movie is found, I don't think any media manager or Kodi can guess that the wrong movie was found. Which is where checking after the scrape, is standard procedure. But, if you want no nfo, then look at Movie Preferences, Scraper tab, at bottom middle. Check the option "If failed scraped, do NOT save an nfo file!" Media Companion can handle duplicate movies with Extended-Edition, Directors-Cut etc. Look at Movie Preferences, Advanced tab. You can see a list of 'Separate Movie Identifier' namings. Have these namings in the title of the video file, and MC will scrape them as separate movies, keeping this identifier in the title. All the above will scrape independently and be listed in MC (and Kodi) as separate movies. You can also add your own identifier to MC. Just Note, no spaces between words, use a hyphen symbol. Thank you and as I enabled your suggestions I noticed many features that had escaped me. I will try to speed up my learning curve! 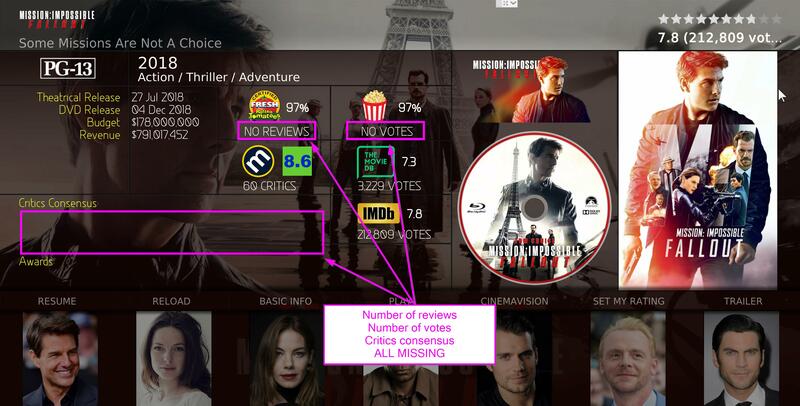 Some ratings/reviews data is only added in Kodi 18 - MQ 7 after doing a manual reload of each movie. 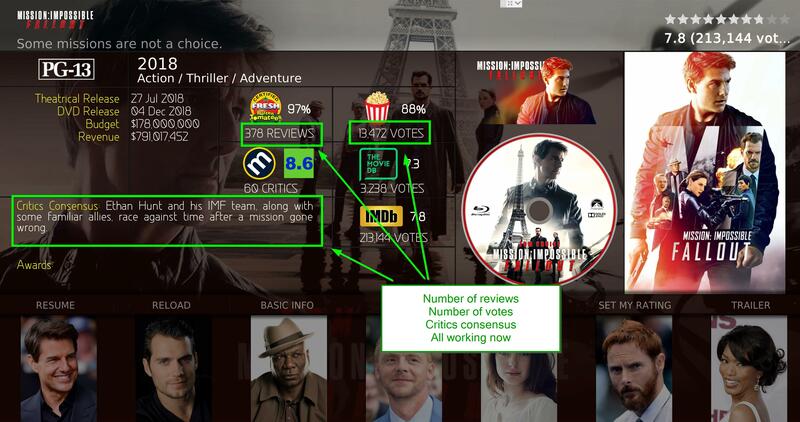 This is a bit of speculation but I think this is caused by the initial scraping of the movie directory (using Universal Movie Scraper and having a movie.nfo file with metacritics, tmdb and imdb votes in each movie folder) does not automatically use the Metadata and Artwork module for populating the RT votes/reviews and critics consensus data. Going through all my movies and doing a manual reload of each of them, would fix this issue, but would take forever. Also, I am working on a video guide for the perfect KODI setup (using Media Companion 3) and I would like to not have a step called "now go reload each movie manually". So I need some way for Kodi to do this part automatically, without me having to reload each movie manually OR I need a way for Media Companion 3 to add the missing data to my NFO files, so they are added correctly in to Kodi automatically. Ok that's it. Sorry for the long post, but I think that's it. Any help on how to solve this will be greatly appreciated. Thank you. The only think I am still struggeling with is the critics consensus, but I think that will be replaced with some more useful information in a future update of MQ 7 if I am not mistaking. If you not want to refresh manual reload one by one you have to delete the whole db in kodi and read it new into it. If you want to refresh your metadata from nfo, take a look at Updating or removing videos (wiki). Just a quick question, any help is appreciated. I have 2 movies, Harry Potter & the Philosopher's Stone & Harry Potter & the Sorcerer's Stone Extended. Harry Potter & the Philosopher's Stone Extended. Now I assume that's because TMDB only have the 1st title available. There are images available for Harry Potter & the Sorcerer's Stone, so I would like to be able to scrape that title. Is there any way to do this? Hope I made sense above. (2019-02-12, 14:16)JanM201 Wrote: I have 2 movies, Harry Potter & the Philosopher's Stone & Harry Potter & the Sorcerer's Stone Extended. This text passage told me that the basic understanding of how scraping data work is still a little catching up and a few things were still misunderstood on your side. Movie version handling is already very well developed by MediaCompanion and works very well. It is actually very well described in the MediaCompanion Wiki, but I assume you already read it before you posting. No matter how many versions of a movie exist, there is only one entry (ID) in the scraper database. If your file is called "Harry Potter & the Philosopher's Stone Extended" MediaCompanion is searching vor exact this title, believes but extended belongs to the title and therefore finds nothing. Then add to the title your version suffix manual (or/and also in originaltitle and sorttitle) -> done. Call your movie file first the same name as original version, scrape it. It will find the movie cause the version suffix is no longer a hindrance to matching. Then rename file as you want and the same name to the .nfo. Make a list of all the version suffixes you have ever come across or will be accommodated. From now on the movie version suffixes will be ignored on scrape process. -> Moviefile version suffix and Movietitle version suffix hope is now declared. -> Furthermore, the film lengths also play a role. The length can be scanned via the database or via the file. If you scrape across the database, all lengths will always be the same, only if you scrape the length over the file will you get different data. (Furthermore, there are movies different PAL or NTSC versions what the length can be variable anyway, so I recommend the length of the file. -> There are cases where different versions of films sometimes show actors more or less. There is no solution for that. Either you live with it, or edit the actor manually into the .nfo and place an actor thumb. The same applies to different release dates. I hope I could help you with your scraping learning curve, leave a thumbup if i could help.